Browse our MACS® Antibodies perfectly suited for the identification and enumeration of human, mouse, rat, or non-human primate cells by flow cytometry or microscopy. 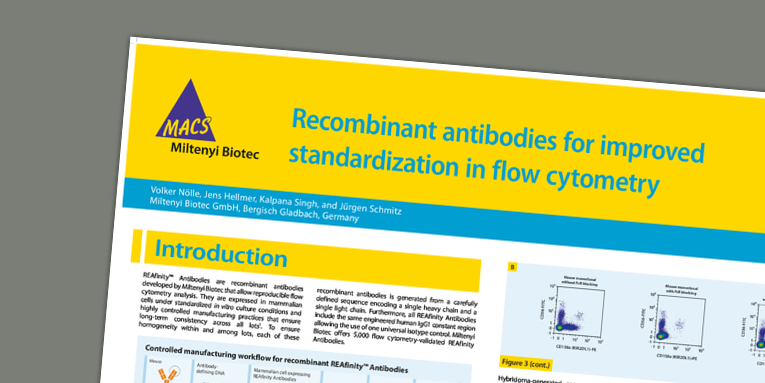 Our REAfinity™ Antibodies are recombinantly engineered to provide highly specific antibodies that no longer need a Fcγ receptor blocking step and require only one isotype control, saving you time and effort. The Vio® Dye family of fluorochromes are ideal for your multicolor flow analysis due to their high fluorescence intensities and low spillover. Working with a dim antigen or rare cells? VioBright™FITC gives you greater flexibility in your multicolor panel design with brightness similar to PE. Can't find the marker and dye combination you need? Use our Custom Antibody Design Service.